Introduction: Changes to surgical working hours have resulted in shorter training times and fewer learning opportunities. Tools that develop surgical skills ex-vivo are of particular interest in this era. Laparoscopic skills are regarded as essential by many for modern paediatric surgery practice. Several generic skills models have been reported and validated. However, there is limited evidence regarding the role of procedure specific models. Here, a laparoscopic paediatric hernia repair model is trialled with surgical trainees and their competence compared with consultant colleagues. Patients and Methods: An ex-vivo paediatric inguinal hernia repair model was devised. Surgical trainees from 5 specialist centres were recruited and performed multiple standardised repairs. Results: 23 trainees performed 192 repairs. Experts performed 10 repairs for comparison. Trainees were timed performing the repair and their accuracy measured. With repeated attempts trainee's timings and accuracy improved until by the 10 th repair they were no different from benchmark consultant scores. Conclusion: A simple, procedure specific ex-vivo training model has been evaluated for laparoscopic hernia training in paediatric surgery. The results suggest improvements in competence with repetition. 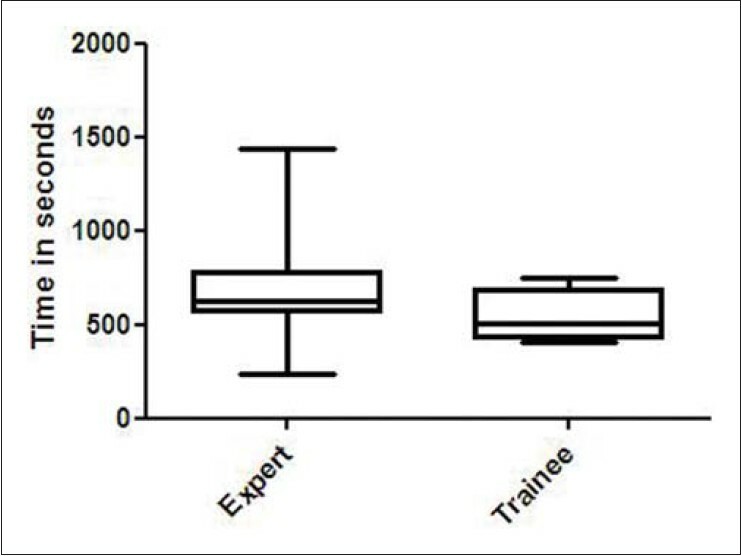 Trainee and benchmark consultant scores are no different by the 10 th trainee attempt. We conclude that this model may have a valuable role in the training and assessment of future paediatric surgeons. The Calmanisation of United Kingdom (UK) surgical training and adoption of the European working time directive (EWTD) have resulted in shorter training times. The experience gained by a trainee upon completion of training has dropped from a pre-Calman total of up to 30,000 to only 8,000 hours. With the recent implementation of the 48h working week even larger teams of non-consultant surgeons are required to provide compliant rotas and a further drop to 6,000h is envisiaged. 90% of junior doctors consider training to have deteriorated  and the impact on surgical trainees, particularly with regard to the reduction of training opportunities is widely recognised. ,, These changes have emphasised the importance of finding ways to improve the efficiency of surgical training. Technical advances including instrument miniaturisation and wider availability of expertise has resulted in a broad range of laparoscopic procedures being available to children and infants. Anecdotal evidence and large series suggest that the laparoscopic treatment of inguinal hernias in the first year of life is safe and effective. It allows inspection of the contralateral deep ring which, given an operation rate for contralateral hernia of 7%,  is seen as an advantage by many. The results of a multi-centre study comparing laparoscopic to open inguinal hernia repair  are awaited. For the paediatric surgery trainee with basic laparoscopic skills, repair of the infant inguinal hernia may be a suitable target as an "entry level suturing laparoscopic procedure". The majority of middle grade trainees have the technical skills to perform the open procedure but difficulties in the anatomical dissection are not uncommon. By comparison, the laparoscopic approach simplifies the anatomy and the surgical objective is clear (circumferential suture to close the patent processus vaginalis), but many trainees lack the necessary skills to carry this out. Laparoscopic surgery requires different skills to those used in open surgery. , These skills can only be acquired through hands on training and regular practice. , Ex vivo laparoscopic training models have previously been validated. These models have been shown to differentiate between paediatric surgery trainees with varying levels of laparoscopic experience  and help improve generic laparoscopic skills. However, no simple procedure specific training models have been reported. To facilitate the acquisition of these laparoscopic skills we have modified the "double glove" model, previously used to assess/develop generic laparoscopic skills, into a specific laparoscopic hernia trainer (LAPHERT). A multi-centre prospective evaluation of the model was carried out. All paediatric surgical trainees from 6 centres in London where invited to participate. A supervising consultant and local co-ordinating trainee where recruited for each centre. To ensure standardisation of the model and protocol an instructional DVD was shown to all trainees in each of the centres during an introductory presentation by the principle investigator and reinforced regularly by personal contact and presentations at a monthly regional paediatric surgery meeting. The model was a modified version of the "double glove" reported by Nataraja , - itself adapted from Kumar et al. Briefly; a standard small blue latex-free glove enclosed in an outer white latex glove. The inner glove is filled with 250mls of water and both are sealed at the wrist. A circular hole is cut in the centre of the palm of the outer glove to represent the hernial defect. This hole is created by drawing around a 5 pence piece with a ball point pen. This pen line is then retraced on its inner aspect with a thick black marker pen. Finally the hole is cut from the outer glove around the inside of this black, thicker circle. Next 2 × 1 cm lengths of standard builder's fine twine are affixed with liquid adhesive glue (UHU® ) to the inner blue glove at the 6 and 7 o' clock positions, ensuring half their length protruded into the "hernial" defect, to represent the testicular vessels and the vas deferens respectively at the left deep inguinal ring. 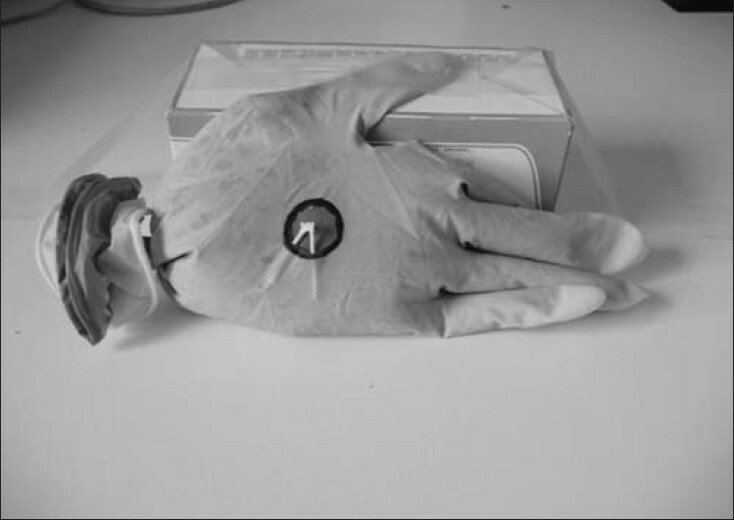 Although the model can represent both anatomical sides, for standardisation we only used a left sided model with the fingers of the glove always to the right [Figure 1]. Figure 1: Laparoscopic hernia repair model (Left sided) There is a circular hernial defect in the centre of the outer white glove with vas and vessels atthe 6 and 7 'o' clock positions. The repair involves placing a circumferential suture in a clockwise direction starting at the 2 'o' clock position without damaging the underlying water-fi lled blue glove or vas and vessels. An intra-corporeal knot is then tied to close the defect and complete the repair. To perform the exercise, trainees placed the model inside a laparoscopic bench trainer securing the thumb with tape to a pre-positioned empty suture box. This ensured stability of the model during the repair. A round bodied, 20 mm 4.0 monofilament polypropylene sutures (prolene) was cut to a length of 15cm and placed in the bench trainer in front of the model. A clockwise circumferential suture was then placed starting from the 2 'o' clock position and continued around the hernial orifice ensuring no damage to the underlying, water filled glove or the vas and vessels. An intra-corporeal knot was tied to close the defect. The times taken to complete the circumferential purse string suture (procedure specific task) and to tie the knot (generic skill) were recorded. These were combined to give an over all time for exercise completion. Timing commenced once the suture was picked up by the needle holder. The repair was considered complete upon cutting the suture. The accuracy with which the repair was completed was measured via a score chart [Table 1]. Seven distinct recordable aspects of the repair were identified and trainees asked to rate their performance of each aspect from 1 to 3. Adding together the scores gave the final accuracy total (best 7, worst 21). Trainees were asked to complete as many repairs as possible, but not more than 2 on any one day. Each had ready access to the box trainer and other necessary equipment. Pre-prepared models were made available to them by the local co-ordinating trainee. Consultants who regularly carry out live laparoscopic hernia repair completed repairs to provide benchmark expert timings and scores. Statistical analysis was performed on GraphPad Prism Version 5. Non-parametric tests were used with values less than 0.05 deemed as significant. Twenty three trainees from 5 centres completed 192 repairs, 16 (70%) completed 5 repairs or more. Of these 10 went on to perform 10 or more repairs. 10 expert repairs were completed for comparative purposes. All trainees showed significant improvements in both the timings to perform the tasks and the accuracy of the repairs. The time to complete the purse string suture reduced for all trainees with increasing number of attempts. With regard to trainees who completed 10 repairs, there was a highly significant improvement in the time taken to complete their tenth purse string compared to their first [Figure 2]. All trainees also improved in the time taken to complete an intra-corporeal knot with increasing number of attempts. 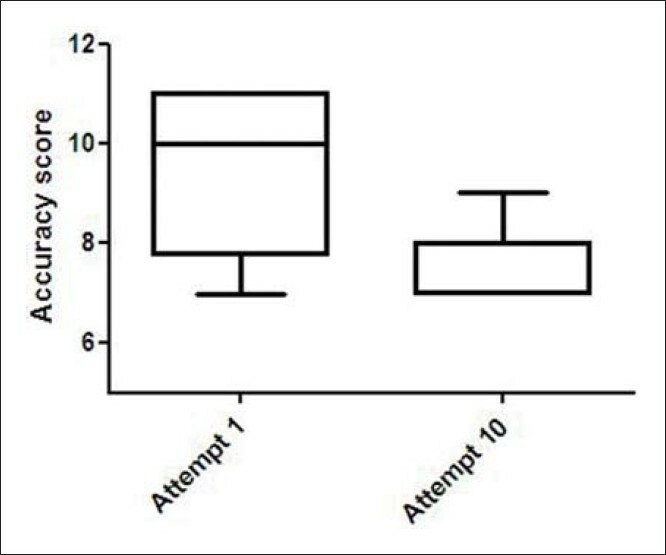 Again, for trainees who completed 10 repairs, there was a highly significant difference in the time taken to complete their first knot compared to their tenth [Figure 3]. Similarly, there was an improvement in the accuracy of repair [Figure 4]. 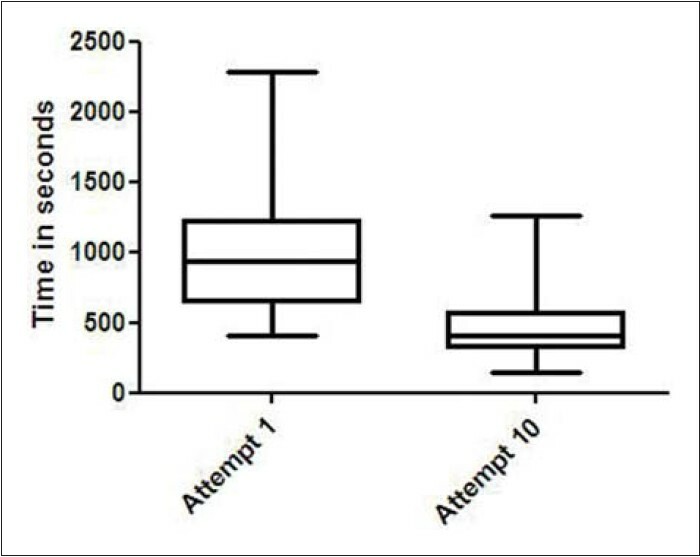 Comparing the 10 th scores of trainees with the consultant benchmark scores, there was no difference in speed or accuracy [Figure 5] and [Figure 6]. Surgical training remains an apprenticeship during which time appropriate skills are learned by repetition. Although many of the skill sets required to be surgically competent are recognised to be different from open surgery , the importance of repetition is true for laparoscopic procedures also. Systems that allow some or all of the recognised learning curve to be achieved outside the operating theatre are an attractive option in balancing the often conflicting needs of training and service delivery. It has been suggested that it is necessary to perform between 30 and 35 repetitions of a task to achieve maximum benefit. 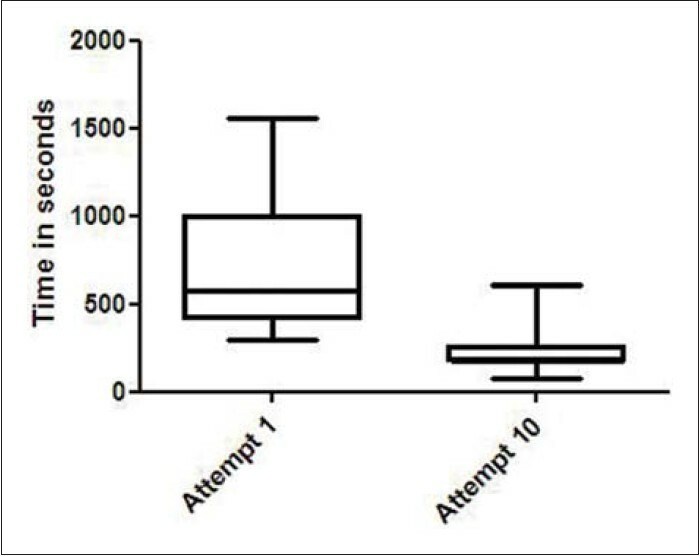 This study demonstrates that after 10 attempts trainees are performing all aspects of the task as quickly and accurately as the experts who were experienced consultant paediatric surgeons routinely performing laparoscopic hernia repairs in children. The implication is that after this number of attempts, the average paediatric surgery trainee could successfully transfer these skills to patients. While initially, this may appear a lower threshold than recommended by other studies such as that by Scott who also recommend over 30 procedures for maximum benefit,  further analysis of this study using medical students and surgical residents confirms that, consistent with our findings, substantial progress had been made by the 10 th attempt at the laparoscopic tasks set. While there is limited consensus as to what constitutes laparoscopic competence for different procedures  and individual trainees vary substantially, anecdotal experience in our own unit strongly supports the suggestion that following 10 "hernia repairs" on LAPHERT, most paediatric surgery trainees are ready for supervised live surgery. The element of self-assessment could be perceived as a weakness in this study. It is recognised that medical professionals and trainees are often inaccurate in self-assessment of their skills. Specifically, surgical trainees often overrate their own surgical competence. This aspect of the study design was included in recognition of the importance of "self-directed learning" and regular "portfolio" updates which are of primary importance in the current training era where trainees are encouraged to take responsibility for their own training. The accuracy scoring chart was designed to ensure the self assessment was as consistent and robust as possible. In addition, a local trainee and consultant were available in each centre to adjudicate borderline scores. There is substantial data from the adult literature on the value of other laparoscopic training models. It is possible to perform entire procedures on cadaveric or anaesthetised porcine models but these come with both practical and ethical considerations. Technology in the form of Virtual Reality (VR) simulators has improved rapidly but costs are high and can be prohibitive. Furthermore, there are real limitations in terms of the nature of the tasks and the degree of haptic feedback provided. ,, Bench trainer models, such as the LAPHERT may not mimic human tissues or anatomy as accurately as biological material; however, there is a substantial body of work which confirms that skills learned are transferable to cadaveric and live surgery. In addition, the model is cheap, portable and a readily available resource that can be accessed and used regularly with and without supervision. Mandatory continual assessment of surgical competency and professional skills is an increasing part of training in many countries. In some regions and surgical colleges, objective structured clinical examinations (OSCE's) now form part of a regular process of review. Surgical competency should be considered as a combination of both time efficiency and task accuracy. In this study we have demonstrated the model to be a useful tool that measures both these constituent parts of surgical competence. We conclude that the LAPHERT is a simple, procedure specific bench model for a paediatric surgical procedure. Trainees from the 5 participating centres improved the time taken to perform the constituent parts of the exercise and the accuracy of repair with repetition. By their tenth attempt the skills for this particular task approached that of experts. Trainees developed both procedure specific and generic laparoscopic skills by using the model, allowing them to travel along a valuable Ex vivo learning curve. We suggest that in the context of the current training era, this and other validated models could be a useful part of the formal part of the training portfolio, allowing both self-assessed training throughout the year and comparative competency assessment. 1. Phillips H, Fleet Z, Bowman K. The European Working Time Directive - interim report and guidance from The Royal College of Surgeons of England Working Party chaired by Mr Hugh Phillips. London: Royal College of Surgeons; 2003. 2. Donaldson L. Unfinished Business: Proposals for Reform of the Senior House Officer Grade. London: DH; 2002. 3. Lowry J, Cripps J. Results of the online EWTD trainee survey. Ann R Coll Surg Engl (Suppl) 2005;87:86-7. 4. Chalmers CR, Joshi S, Bentley PG, Boyle NH. The Lost Generation: Impact of the 56-hour EWTD on current surgical training. Ann R Coll Surg Engl (Suppl) 2010;92:102-6. 5. Skidmore FD. Junior surgeons are becoming deskilled as result of Calman proposals. BMJ 1997;314:1281. 6. Ross DG, Harris CA, Jones DJ. A comparison of operative experience for basic surgical trainee in 1992 and 2000. Br J Surg 2002;89(Suppl1):60. 7. Esposito C, Montinaro L, Alicchio F, Savanelli A, Armenise T, Settimi A.Laparoscopic treatment of inguinal hernia in the first year of life. J Laparoendosc Adv Surg Tech A 2010;20:473-6. 8. Ron O, Eaton S, Pierro A. Systematic review of the risk of developing a metachronous contralateral inguinal hernia in children. Br J Surg 2007;94:804-11. 9. Ron O, Pierro A. The Minimal Access Repair of Contralateral Hernias (MARCH) trial. Personal communication; 2011. 10. Aggarwal R, Moorthy K, Darzi A. Laparoscopic skills training and assessment. Br J Surg 2004;91:1549-58. 11. Aggarwal R, Ward J, Balasundaram I, Sains P, Athanasiou T, Darzi A.Proving the effectiveness of virtual reality simulation for training in laparoscopic surgery. Ann Surg 2007;246:771-9. 12. Madan AK, Frantzides CT, Park WC, Tebbit CL, Kumari NV, O'Leary PJ.Predicting baseline laparoscopic surgery skills. Surg Endosc 2005;19:101-4. 13. Hoznek A, Katz R, Gettman M, Salomon L, Antiphon P, de la Taille A,et al. Laparoscopic and robotic surgical training in urology. Curr Urol Rep 2003;4:130-7. 14. Nataraja RM, Ade-Ajayi N, Holak K, Arbell D, Curry JI. Pilot study of new training model for laparoscopic surgery. Pediatr Surg Int 2006;22:546-50. 15. Nataraja RM, Ade-Ajayi N, Curry J. Surgical skills training in the Laparoscopic era: the use of a helping hand. Pediatr Surg Int 2006;22:1015-20. 16. Kumar BD, Munz Y, Moorthy K, Darzi A. How can a handful of water assess basic laparoscopic skills? Ann R Coll Surg Engl 2003;85:426-7. 17. Derossis AM, Fried GM, Abrahamowicz M, Sigman HH, Barkun JS, Meakins JL. Development of a model for training and evaluation of laparoscopic skills. Am J Surg 1998;175:482-7. 18. Seymour NE, Gallagher AG, Roman SA, O'Brien MK, Bansal VK, Andersen DK, et al. Virtual reality training improves operating room performance: Results of a randomized, double-blinded study. Ann Surg 2002;236:458-64. 19. Seymour N. VR to OR: A review of the evidence that virtual reality simulation improves operating room performance. World J Surg 2008;32:182-8. 20. Cosman PH, Hugh TJ, Shearer CJ, Merrett ND, Biankin AV, Cartmill JA.Skills acquired on virtual reality laparoscopic simulators transfer into the operating room in a blinded, randomised, controlled trial. Stud Health Technol Inform 2007;125:76-81. 21. Scott DJ, Young WN, Tesfay ST, Frawley WH, Rege RV, Jones DB. Laparoscopic skills training. Am J Surg 2001;182:137-42. 22. Dagash H, Chowdhury M, Pierro A. When can I be proficient in laparoscopic surgery? A systematic review of the evidence. J Pediatr Surg 2003;38:720-4. 23. MacDonald J, Williams RG, Rogers DA. Self-assessment in simulation-based surgical skills training. Am J Surg 2003;185:319-22. 24. Evans AW, Aghabeigi B, Leeson R, O'Sullivan C, Eliahoo J. Are we really as good as we think we are? Ann R Coll Surg Engl 2002;84:54-6. 25. Rowan AN. Is justification of animal research necessary? JAMA 1993;269:1113-4. 26. Anastakis DJ, Regehr G, Reznick RK, Cusimano M, Murnaghan J, Brown M, et al. Assessment of technical skills transfer from the bench training model to the human model. Am J Surg 1999;177:167-70.